The necklaces is make of environment friendly alloy material and Inlaid with bright cubic zirconia. 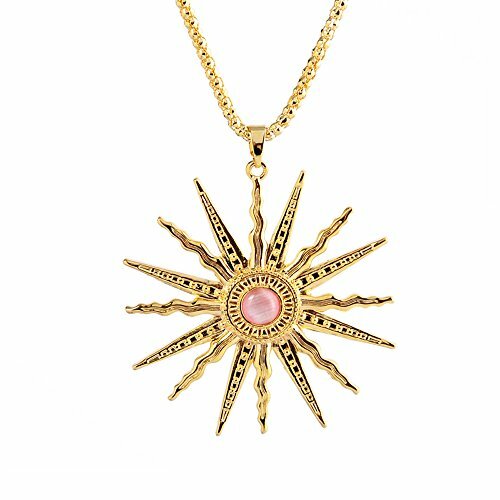 The necklace is design of sun god shape, fashionable and classic, it's more beautiful when you wear it in your smooth neck. The shape is simple and not complicated, that can inadvertently highlight your elegant and mysterious temperament. This is a exquisite jewelry gift, you can purchase it on Mother's Day, Valentine's Day, Christmas, Birthday, Graduation, Anniversary, or other special day for your beloved girlfriend, mom, daughter, fiancee, wife and so on. A beautiful and noble jewelry always adds color to life. If you have any quality issues, please contact us first, we'll respond within 24 hours and solve the problem with your most satisfied way. The paper measurement is intended for reference only. Please Allow 1-2mm error. It is our pleasure to provide you with 100% quality products and 100% customer service. For more styles please search "St.Ushine necklace". If you have any style for you like, please don't hesitate to buy it back! If you have any questions about this product by St.Ushine, contact us by completing and submitting the form below. If you are looking for a specif part number, please include it with your message.